The morning of 24th February at Riihimäki started with a solitary patch of supralateral arc ( 1 ) which was seen in a passing cloud and lasted for only a few minutes. Later on during the day a clearly elliptical glow could be seen in the vicinity of the Sun, and suddenly the glow started to have a defined shape: an elliptical halo. During the 2-3 minutes it took to gather photo gear and go back out was enough to lose the ring; the glow is all that can be seen in the 30 frame stack ( 2 ). While the ellipse-stack was ongoing my attention was caught by two odd visitors: 23° upper plate arc and circumzenith arc. Immediately after change of lens the camera was grabbing images of that strange sight, see a 30 frame stack ( 3 ) and a 120 frame stack (taken with 3 second intervals, so total duration was about 6 minutes) ( 4 ). The elliptical glow remained and sometimes seemed to have a true halo at its outer edge. The last two shots ( 5 - 6 ) show perhaps some kind of an ellipse, but it is hard to be confident since due to severe rush the images are not perfectly exposed and the 12bit sensor data is clearly in trouble because of the strong intensity gradient. Furthermore, the horrible dust of the lens spoils the images completely. Digital image processing methods, such as levels- and curves -adjustment and unsharp mask filter, are merciless regarding the cleanliness of the optical surfaces. Apologies for that. During the ellipse - 23° plate arc - CZA -phase the sky was blue and snowflakes were floating down. The wind was not hard, but clearly noticeable and temperature in the ground was about -13°C. The halos seemed to be formed in an AC virga -type of "cloud", but the origin of the virga remained a mystery - there were no clouds seeding it. It is impossible to say whether the ellipse and the other halos were formed by the same cloud material or not. Some of the snowflakes were studied under microscope, but nothing peculiar was seen, just plain snowflakes. On the 22nd of February Eetu Saarti managed to shoot a lunar elliptical halo in Tampere, whose duration was less than 30 seconds(!) ( 7 ). 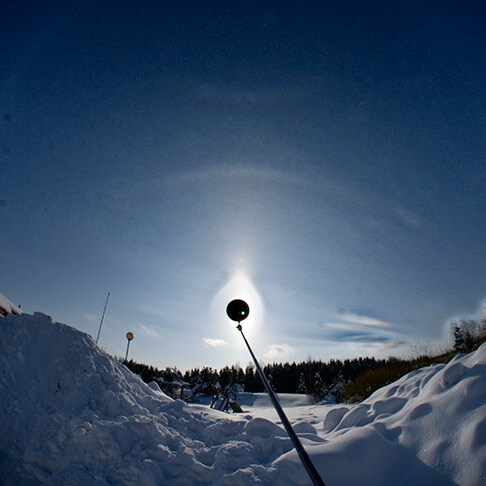 Nice halo day for Ruoskanen. Normally, if you stack a 23 plate arc that you think is solitary (occurring without other pyramid halos), you always get 9 halo or 18 plate arcs in the stack. Here is just 23 plate arc. And the ellipse is there in the photos. I think I see some Ac-type formation in the horizon in this image? Also some cumulus fratus type cloud perhaps? And of course the helic arc in the last photos on your site is a nice catch. A few Cumulus fractus -clouds floated through the sky, yes, but those seemingly did not produce the virga or have anything to do with the halos. But who knows. Ac was not present at any time. Judging from the wind direction one possible seeder came into mind: a paper mill at Tervakoski some 10 km away. That plant produces tremendous ice fogs sometimes, and perhaps was the one to blame for this display. Seeing 23 plate arc is, for some unexplainable reson, always a treat. Although there is "some" gap still between this display and Walt's new year eve -display, this was a decent ice fog generated 23 plate arc in Finnish conditions.